OTTAWA—Peter Kent, Minister of State for the Americas, reiterated his concern on Sunday over dwindling democratic rights in Venezuela as he condemned the Latin American regime’s “outrageous and unacceptable” rebuke of a statement he issued on Jan. 28. Kent’s statement expressed concern over President Hugo Chavez’s order to suspend the licences of six television stations on Jan. 24. 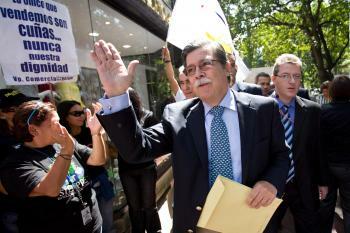 Among them was opposition channel RCTV, which is highly critical of Chavez’s leftist government. The minister also noted his regret that two students were killed during protests that followed the suspensions. 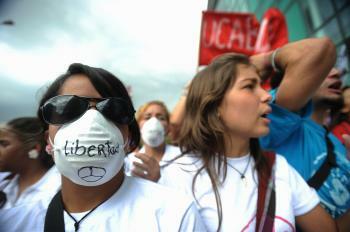 “These events are further evidence of a shrinking democratic space in Venezuela. Freedom of expression and access to information from a wide range of sources are fundamental elements of a healthy democracy,” Kent said, urging Caracas to immediately restore the stations’ transmissions. In response, Roy Chaderton Matos, Venezuela’s ambassador to the Organization of American States (OAS), on Feb. 3 accused Canada of supporting “coup plotters” and “destablizers” attempting to overthrow the government, according to a Canwest news report. “I am talking of a Canada governed by an ultraright that closed its Parliament for various months to [evade] an investigation over the violation of human rights,” Chaderton said, adding that he was referring to “torture and assassinations” by Canadian soldiers in Afghanistan. While Prime Minister Stephen Harper’s decision last December to prorogue Parliament did receive criticism over disruption of a parliamentary inquiry, the allegations actually have to do with whether Canadian troops transferred detainees to Afghan authorities despite warnings that they may be tortured. Last Sunday, while Chavez praised Chaderton during his weekly television broadcast, Kent, who was an award-winning broadcast journalist prior to his election, condemned Chaderton’s comments. “It’s offensive, it’s unacceptable, and it is desperation rhetoric. . . . Democratic space within Venezuela has been shrinking, and in this election year, Canada is very concerned about the rights of all Venezuelans to participate in the democratic process,” the minister told Canwest. Kent said that when he was in Venezuela only the chair of the foreign relations committee was available to meet with him, but no senior government officials. “They are respected members of civil society who have concerns across the spectrum of democratic governance and who feel and have been threatened in a variety of ways as they try to exercise some of the democratic practices and principles that Venezuela has committed to in signing the Inter-American Democratic Charter,” he said. Venezuela passed a law last December requiring all national media outlets to broadcast government officials’ speeches. The six television stations were taken off the air on Jan. 24 for refusing to broadcast the leftist president’s frequent fiery and lengthy speeches. Chavez, first elected in 1998, was re-elected in December 2006 with 61 percent of the vote. Since then, the president, who has a military background, has markedly intensified political reforms. On Feb. 15, 2009, Venezuelans voted in favour of a constitutional amendment to remove term limits on all elected offices. Canada, the OAS’s second largest financial contributor with an assessed contribution of approximately $11.4 million in 2010, is monitoring the impact these reforms may have on the standards of democracy and human rights endorsed by all OAS member states.